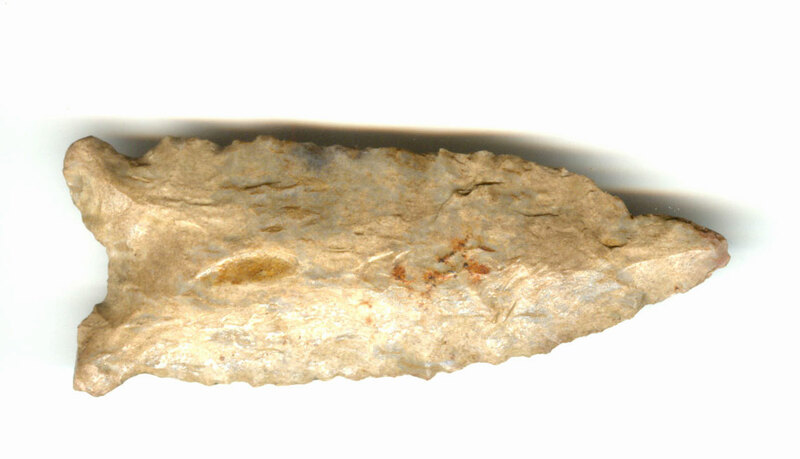 A Large Size, Nicely Flaked, Visibly Aged & Typically Made Greenbrier Point That Exhibits Surface Sheen & Stone Aging Coloration Patination, Heavy Aged Surface Deposits, Correct Style Basal Thinning And Ears, Correct Blade Sharpening Use Reduction, Correct Early Style Of Blade Flaking, Correct Material And Manufacture For The Area Found. From The Garth And Lemon Slough Area, Near Mussel Camp Road. This Example Displays Age And Ancient Visible Tip Rotation Use Wear! Includes A Ken Partain Certificate of Authenticity!